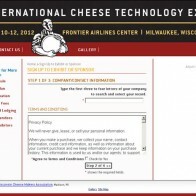 International Cheese Technology Exposition Launch - Amplitude Design, Inc.
Amplitude Design, Inc. is proud to announce the launch for the ICTE 2012 Online Booth Sign-Up. We received positive feedback and are pleased with the response. ADI used Authorize.net AIM for credit card processing. 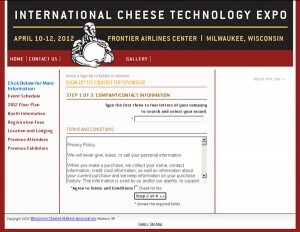 The registration application included a five page form for both Booth Sign-Up and Sponsorship. In just fifty minutes we received 32 orders and 25% of the 2012 show sold in the first day.